“My life was like The Wonder Years and I was Kevin Arnold. I was a hippie-jock. That was my life in Southern California,” smiles Cindy Petito, the youngest of the long-time, locally beloved Petito Sisters. When she was just ten years old, the family moved to San Pedro, California, leaving their parents’ hometowns of Port Dover, Ontario and Niagara Falls, N.Y.
Cindy was one of two from her sixth grade class to receive the President’s Physical Fitness Award. “I had a certificate signed by Richard Nixon and won a year’s membership at the YMCA,” she says. Cindy would load up her bike, swimming fins dangling from her handlebars and a raft bungied to the rack, and ride down to the beach after classes. Afterwards, there were wet suits and sand strewn across her bedroom floor, which she recalls fondly, would keep the family cats entertained. Cindy played volleyball and skied throughout junior high and high school. 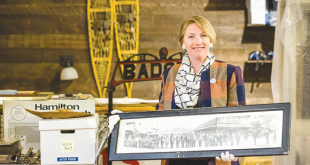 “I learned to ski on the hillsides of the Palos Verdes, in southern California, by the beach,” which seems like an odd and impossible feat for the warm climate there, but she explains, “They brought snow in by the truckloads and we learned to ski at night since it would get too warm in the day. We also had a ski club and we’d get used to our skis by practicing on the grass.” The ski club took trips up to Big Bear resort. She worked odd jobs, working in a greenhouse, babysitting, cleaning houses. Lynda had moved to Crested Butte in June 1978, and Cindy moved to Crested Butte site-unseen. “I had known about Crested Butte from my ski magazines and also, my sister was here. I remember driving into town in Bonnie’s VW bug and thinking ‘Wow, this is the wild west.’ The streets weren’t paved and there weren’t many people around. I was 20 and I felt like I was on the set of a western movie,” she laughs. She also became an avid mountain biker. During her early days as a new Crested Buttian, Cindy worked for the Crested Butte Chronicle doing the layout and paste-up and became the sports writer as well, using the byline Lois Lane. In her first summer here, Cindy became involved with the Crested Butte Mountain Theatre, designing sets, costumes, and posters. In 1982, she acted in her first play, the summer production of Bleacher Bums. She had been reluctant to audition but her sister Lynda insisted. After that first performance, she was hooked, unstoppable and couldn’t stay off the stage, acting in three more productions. When the couple went their separate ways in 2001, Cindy moved to Denver with the girls, in order to expand their experiences. “The spark to move was that there was a girl’s hockey team there,” she says, and both her girls played. 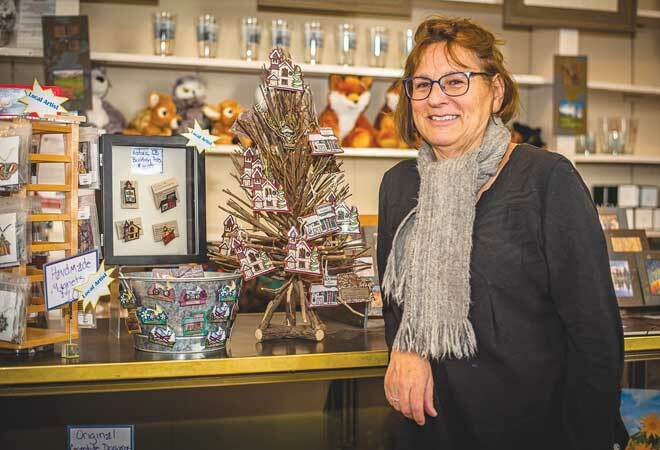 During her time in Las Vegas, Cindy began to develop her own line of jewelry and ornament design, which she now sells in the Crested Butte Heritage Museum. 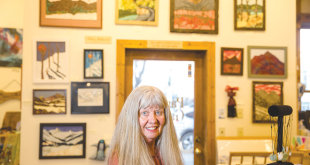 The spring of 2018 brought changes once again for Cindy when she and her husband split and she decided to return to Crested Butte, the place she felt was home. With her sisters and their families residing in town, it was a good move. She worked part-time at the Crested Butte library before getting hired last August at Western Colorado University (WCU, formerly WSCU and WSC) as an administrative assistant in the Communication Arts, Language, and Literature Department (CALL). “Basically, I serve 25 faculty members and I love it. I’m learning a lot of new things. Everyone’s very supportive,” she says of the learning curve. “I wouldn’t have even applied for the position if it wasn’t for the free RTA bus,” she says of the 45-minute free shuttle ride from Crested Butte to Gunnison. 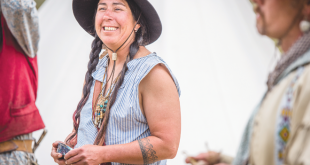 Cindy feels that here at the end of the road and seemingly far from the outside world, “You push yourself to do something you didn’t think you could do and you surprise yourself because you learn that you really are more than you think you are. Not everybody can live here. That first winter I spent here, I really loved that feeling, that it was so extreme and not everybody could be here. It was such a magical time, back in the era when I first arrived. I’ve always been drawn to the cold and yet I also consider myself a beach person. I went from one side of the country to the other and ended up in the middle,” she says.